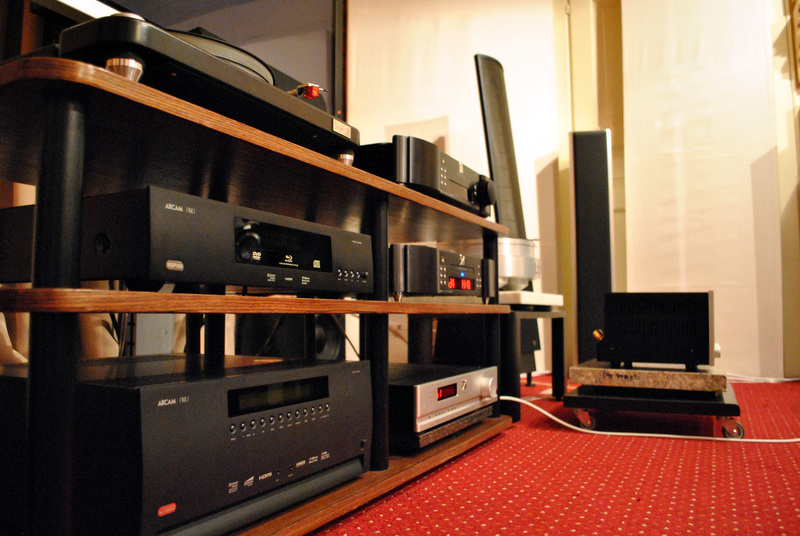 If you remember , some time ago I have told you about a pair of speakers that impressed me very much at that moment. 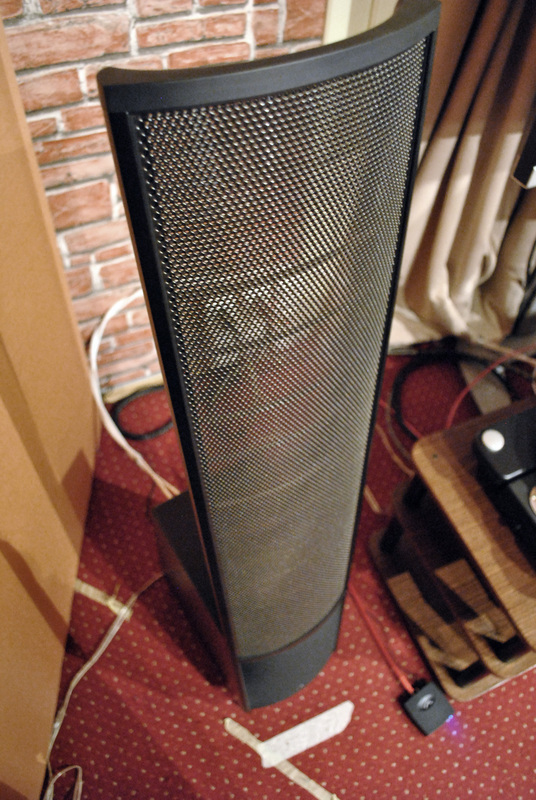 I am talking about the Martin Logan Electromotion ESL . Since then I have tried to listen to them every chance I got. I have listened to very good and expensive speakers and the ESL are the only speakers I have listened to just after listening to >20k $ speakers and still managed to impress me. I felt like they deserved a full review, so here it is. They are the first electrostatic speakers I have heard till now and I must say they are something special. That membrane is for both mids and treble. The bottom contains a woofer for the bass. Considering the fact that the membrane is for both mids and treble, I thought the sound should be very transparent and very precise as there shouldn’t be any phase/timming problems, and I was right. I found the build quality to be very good and the design very appealing. The curved panel is very helpful as they are more forgiving to the position they are set into the room. You can find more on the Martin Logan ElectroMotion ESL here. This phrase is taken from their website and I totally agree on the mini-flagship part. Let’s get down to business and see how these babies perform. The test have been done with : Simaudio Moon 650D Dac, Moon 340I amplifier, Martin Logan ElectroMotion ESL , Chord Sarum (speaker interconnects), Neotech Sahara Xlr (dac to amp interconnects). These speakers need a potent amplifier to drive them to a decent level and Moon 340I did a great job at that. The room they were tested in, had ~28 square meters and 3 meters height. I feel like they need a big room like this to perform really well. Hard to describe it in words. I felt there, in the music. It was like the voices were right there besides me. The trumpet is breath taking, it has such depth and texture that I got goosebumps immediately. The soundstage and imaging are out of this world. Details you will ask? Well…the micro details are now macro details, you hear everything with these babies. The bass is very controlled and with good impact. You know by now that I am a big fan of transients, especially attack if the decay is not too long, and the attack on the ESL is breath taking. When I closed my eyes, I felt in the concert room, I saw the orchestra and pinpointed every instrument there. The transparency is amazing. It is like a window to the music. The details were incredible. I felt every stroke, every chord and instrument. The sound was holographic and the electric guitar was amazing with an excellent extension and spatial feeling . I was in a ~27 square meter room and 3 meters height, but I felt in a huge concert hall. The transparency of the whole sound and of the voice is unique and it may be one of the cleanest sound I have ever heard. The piano from the beginning gave me a shiver through the whole body. It was just amazing how clean the piano notes sounded and how well it delimited the space in which the piano was. The violins were in back but still had a very good feel and tactility showing very good dynamics. I had to take some time to relax and get it together after this one. Yes, it sounds that good. I never heard anything like it. Every pluck on every guitar chord has tactility and excellent feel. The voice is extremely clear . Again the sound-stage is above everything I have heard until now. If you ever listen to this, make sure you are sitting down, as it sure blew me off my feet. I know I already included a song from Leonard, but this one is quite different than the last one, including Leonard’s voice that has a lot more depth and body in “Here it is” . In this song the women voices were amazing and again very transparent. Leonard’s voice had a very good texture and was again very clean, however there could be people that could prefer more body as with LCD3/LCD2 as ESL has a tonality more similar to HD800. I have never heard this song in this way before. It was breath taking again. It sounded and felt better than when I went to a real flamenco show (and I was in the first row, right near the scene, even felt the sweat from the dancer , not kidding :)) ). The transients are amazing . The guitars were so real, with such excellent extension. The ESL became my number 1 reference for this. The dynamics, the energy transmitted by the song through the martin logans was absolutely amazing. Can these babies rock? Yes they can. The PRAT was very engaging and full of energy. The separation of instruments is top notch and made the song sound very relaxed and airy. The voice was very well delimited and clean, with a separate layer as all the other instruments, never blending in with anything. Even if they wouldn’t be the first pick for rock music, they know how to rock with style. This blew me off the chair. The sound came from every direction. The bass has a very good punch and impact. It could use more depth and extension but it was awesome overall. The huge membrane for mids and treble made was felt accordingly. The presence of these speakers is just amazing. It’s like being hit by a wall of sound. The attack and transients on this song were goose bump producers. The bass has a very good punch and control. It could use a little more depth but overall it is amazing and it blows you off the chair. The mids are breath taking and very clean. The voices & instruments sound extremely clean and have amazing presence and texture. The treble is excellent as well, with very good extension and details. The treble can be a little peaky from time to time, being a little similar to HD800 in this department. These might be the best transients I have ever heard. The attack is incredible and gives energy and life to the music. The decay is fast but natural. I have never been through a similar experience until now. Even though I was listening in a ~27 square meters room, when I closed my eyes I was in a huge concert hall, pinpointing every instrument’s position with great ease. These are the most transparent speakers I have ever heard until now. They just open the window to the music. With them, it’s just you and the music. With the ESL the micro details become macro details. The recording doesn’t hide anything from you. I think they might be even comparable with HD800 in this department or even above. I must say that I fell in love with these speakers and I hope that one day I will own a pair of my own. They became a reference for me in many departments. I felt that the Martin Logan ElectroMotion ESL could easily beat speakers more than twice or even triple their price. I even felt like they have some very strong points compared to >25$k speakers. They are really something special and they deserve all of your attention. Or rather…let the music begin! I auditioned the ML ESL’s, connected to some pretty high end electronics, in room that was acoustically treated. The mids and highs were very, very good. The bass, however, was disappointing, and reason enough for me to continue looking. The Martin Logan ESL’s confound all expectations. The transparency, depth and soundstage imaging is jaw dropping. As far as bass is concerned, anyone not using powered subwoofers in this day and age is a confirmed “Old School” enthusiast. Hook up 2 SVS 13″ Ultra’s or 2 JL Audio E12’s, set the X-Overs at 50-80hz , and prepare to be amazed with a top to bottom cohesive & powerful sound. 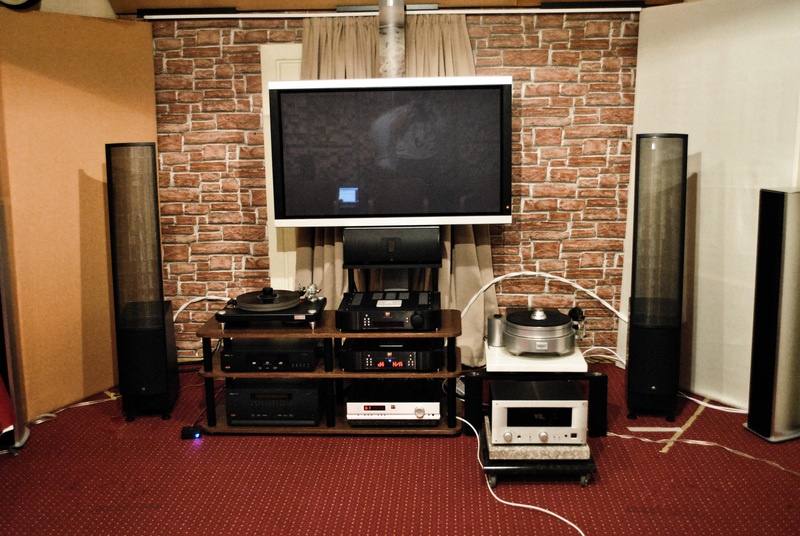 Prima Luna tube amps are heaven sent with these speakers.
. I auditioned the ESL’s a week ago at Best Buy’s Magnolia room. I never heard such amazing sound. Several songs had me fighting back the tears. Diana Krall especially. So, I am saving my pennies to get these speakers. I did replace my Def Tech 1000 with Martin Logan’s Motion 8 center speaker (refurb from Safe & Sound) a couple days ago and that alone made a huge improvement to the system. Now it is far more transparent and open. The Def Tech 1000, although a very decent speaker (better than the Polk it replaced), was really outclassed the Motion 8’s and that Heil tweeter. God bless Oskar Heil! Indeed, these are great speakers for the money. Actually I own a pair of Ethos now. Wonderful speakers. Review coming soon. Still have to do some tweaks to make them sing properly, but I am not far. By the way, check out the new series from Martin Logan. From what I’ve seen they are refreshing a lot of their speakers, including the ESLs, and if you didn’t know that, you might end up buying the “old” models.